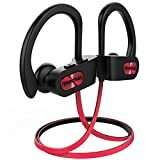 The Mpow Flame Bluetooth Headphones have been the best-selling wireless earbuds on Amazon’s site for nearly a year now, and it’s easy to see why. They typically sell for under $30, and that modest sum gets you great sound quality, impressive battery life, and class-leading IPX7 water resistance. They often go on sale for between $20 and $25, but we’ve got an exclusive deal for you today that drops them to the lowest price ever. Use the coupon code BGRFLAME8 and you’ll pay just $15.99! If you’re not among the hundreds of thousands of people who have already bought them, or if you want to knock out some of your holiday shopping ahead of schedule, definitely take advantage of this exclusive sale.